The long awaited Raffle Winners & Happy Thanksgiving! 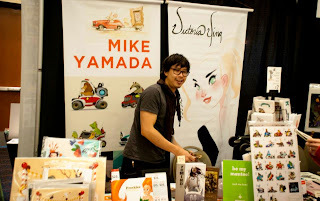 I spent a crazy busy weekend at the CTN expo with my wife. It was my first convention and as soon as each day was over we'd go home to drink a bit of tea and sleep. It was a lot of fun and it was great being able to meet everyone that came by. I can't wait for our next convention. Photo stolen borrowed from Jason Scheier. I just joined Motivarti as a mentor for their spring term. Its the perfect program if you'd like personalized art, industry and career guidance. I'm only accepting 3 mentees and thanks to skype and email, you can be pretty much anywhere. Please visit - http://motivarti.org/mentorship-program/mike-yamada/ - if you're interested and want to learn more/apply. I know a few of you we unable to make it to the convention and we will be launching an online store that will sell our cards/books, prints, greeting cards, stickers and more! All of this will be announced next MONDAY. Just a bit of paint and some tweaks to make it operational. Thanks to everyone that entered and hopefully we'll be able to do another raffle come time soon! If you won, I'll be sending you an email shortly asking for where you want me to send your prizes. 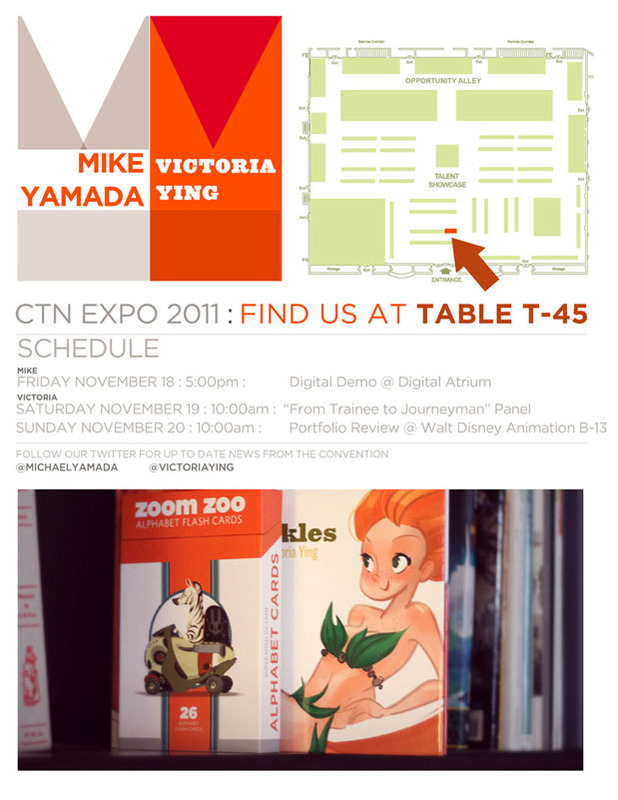 CTN Expo 2011 :: Table T-45 :: 3 days left in Giveaway! 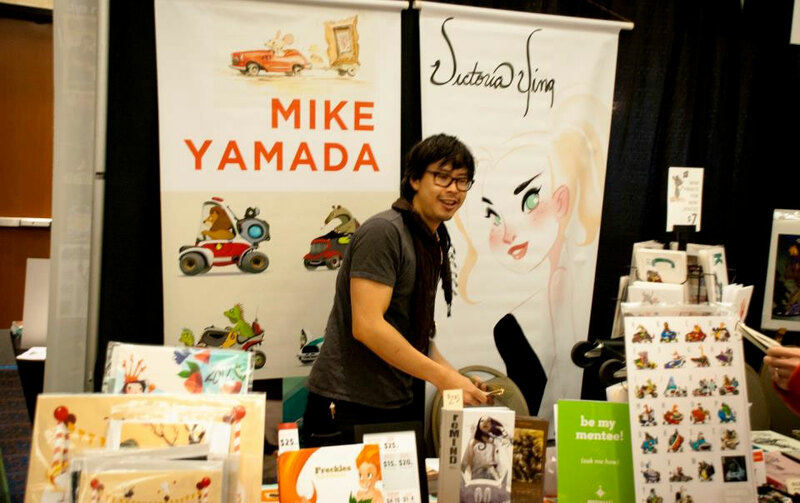 This upcoming weekend (Nov 18-20) is the annual CTN Animation Expo. If you aren't familiar with it, imagine a comic con centered around the art and craft of animation. It's being held at the Burbank Marriott directly across from Bob Hope Airport. You can find more information about attending on their website. I will be sharing booth duties at table T-45 with my talented wife. 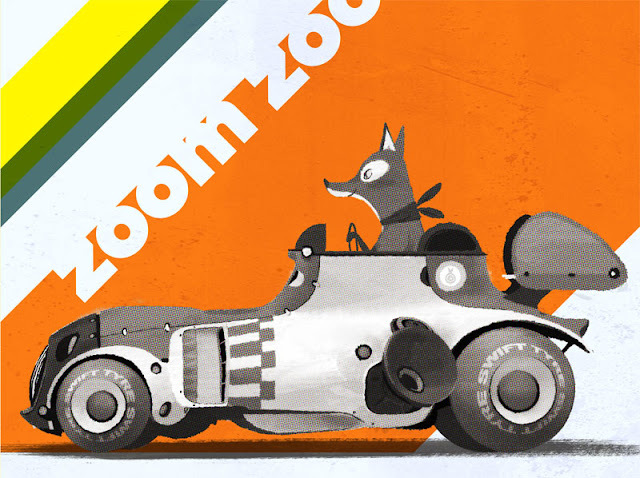 We're going to have copies of our latest projects - Freckles and Zoom Zoo - along with prints, pins, originals & more. Stop by to say hi and peruse our wares. It's always fun to meet new people and connect faces with names. We're also doing a few events at the show. You can find them listed on the above flyer or you can follow our twitters for up to date information. 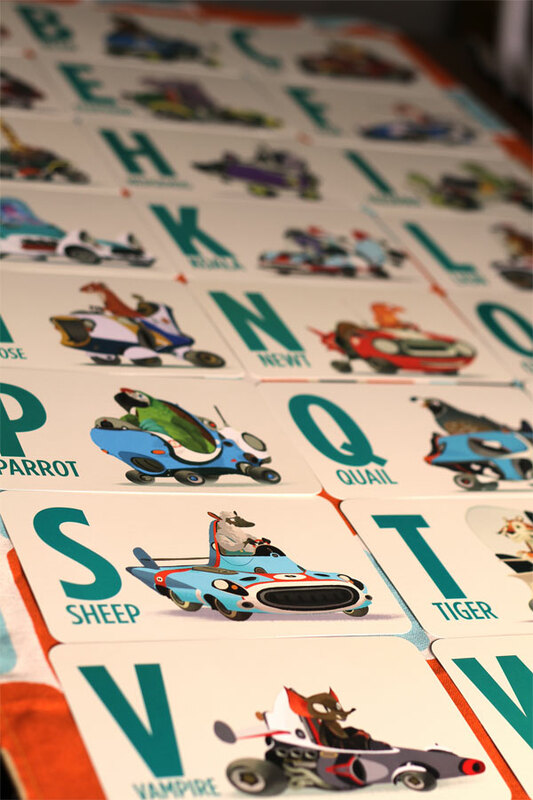 Don't forget about the Zoom Zoo Card giveaway. It continues and the competition is fierce. I can't believe the positive response. 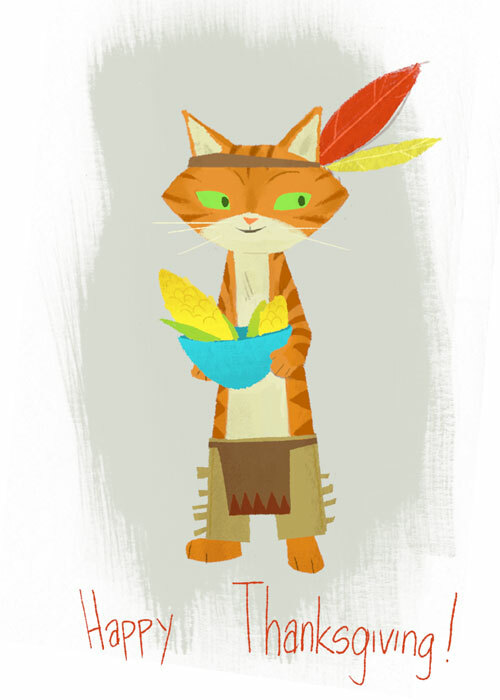 I'm adding a second prize - a small set of prints I'm going to be selling at CTN. There are TWO way to enter. 2) Tweet about it! Use @michaelyamada and mention #zoomzoo for a second chance! I've been working late nights and early mornings to make a few prints to sell at the CTN expo. Here's an except of one I'm still spending some time on. I'm big fan of swiss designer Max Huber and trying to capture a bit of the spirit of his work. I've also received the entire shipment of the alphabet cards and they're now occupying a majority of my dining room. Now a second way to WIN. Tweet about it! Use @michaelyamada and Mention the #ZoomZoo Giveaway for a second chance! The Winner will be announced November 19th. ps. I'm still slowly working on some of the originals from the prior giveaway. Patience young padawan. EDIT : Added a second way to win. I was invited to be part of a show celebrating the anniversary of two epic Japanese shows - Kamen Rider and Super Sentai(you probably know them as Power Rangers). Stop by tomorrow to check out the show and Chris Mitchell's really awesome store - Q POP. Q Pop, Anime Jungle and the JACCC invite you to celebrate the 40th Anniversary of Kamen Rider and the 35th Anniversary of the Super Sentai series(Power Rangers) creation!! Over 150 local and international artists will pay visual tribute to some of the most famous pop culture icons in Japanese history and their creator, manga god Ishimori Shotaro.